Happy New Year! It’s time for resolutions and goals–and as usual I am rolling my eyes. I am prone to over-commitment! And then abandoning my resolutions when I become overwhelmed. A one-word goal keeps things simple and focused. For 2014, my word was READY. Even though I kind of wasn’t. For 2015, I chose ENGAGE. As in stepping out, joining the conversation. And in spite of health setbacks, I did. For 2016, I’m taking things to the next level with BUY IN. Okay, so it’s two words, but still. This is plain old COMMITMENT, but with a kick. When we spend time and money, we’re serious. Consistency is the key. I have 30 minutes in the morning and again after school–and Saturdays. Feed the pipeline, as they say in sales. 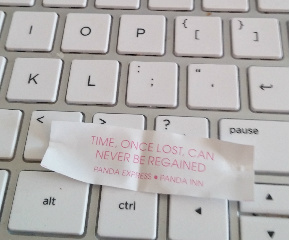 Trust Panda Express to deliver a fortune cookie reminder: “Time, once lost, can never be regained. How about you? Would you like to choose a word for 2015? Check out MyOneWord.org. Listen. Listen to God. Listen to my heart. Listen to my friends. Listen to my body. Listen to my adversaries. Listen to my students. Shut out the chaos and listen to the quiet voice inside me.